The VS-D250 transmitter is supplied in a housing for DIN rail mounting. It has 2 sockets for output cards and a 2 x 4-line display. Consequently, the VS-D250 can be equipped with either a total of 2 analog outputs or 1 analog and 1 serial output (RS232 or RS485). 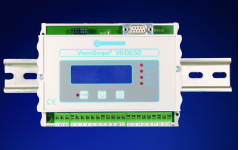 The analog outputs can be configured as required in the same way as for the VS-x450.